Hey all, TGIF! Here's hoping that the Kansas weather calms down a bit. Our blaring weather radio and my phobia of tornados is playing havoc on my sleeping. We also had to cancel a big bonfire the girls were going to have because of the weather. On to Project Life Week 13 though. This was a fun week because I used mostly My Mind's Eye products for my spread. I love those 12 x 12 pieces of patterned paper that you can cut into journaling cards. Here's my 2 page spread. 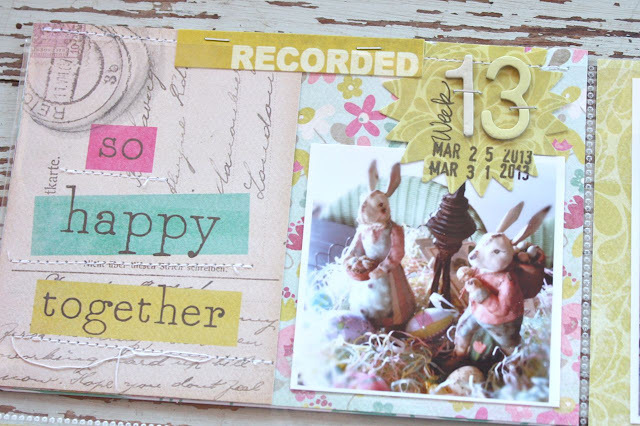 This was Easter week so the pastel colors fit right in with the theme. 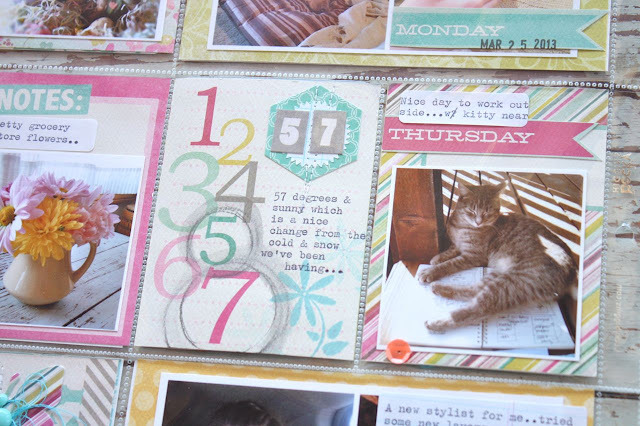 I got this week's photo scrapbooked in record time due to the everything coordinating. Still loving the weekly dated insert. I added a small Instagram + some ombre letters + date stamps. 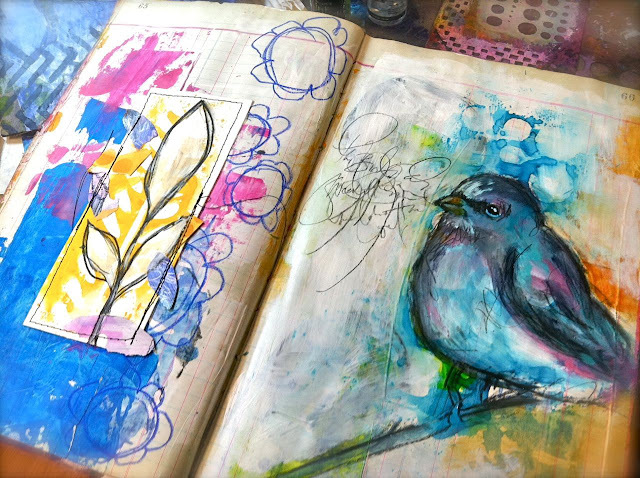 You can see in the top left corner that I added some scribbled circles using the fun water soluble pencil in my Art Journaling Kit. I love the softness that the watered down graphite lends. Here's a photo of Josey with her p-corn. Always a slang name for everything, this time popcorn. 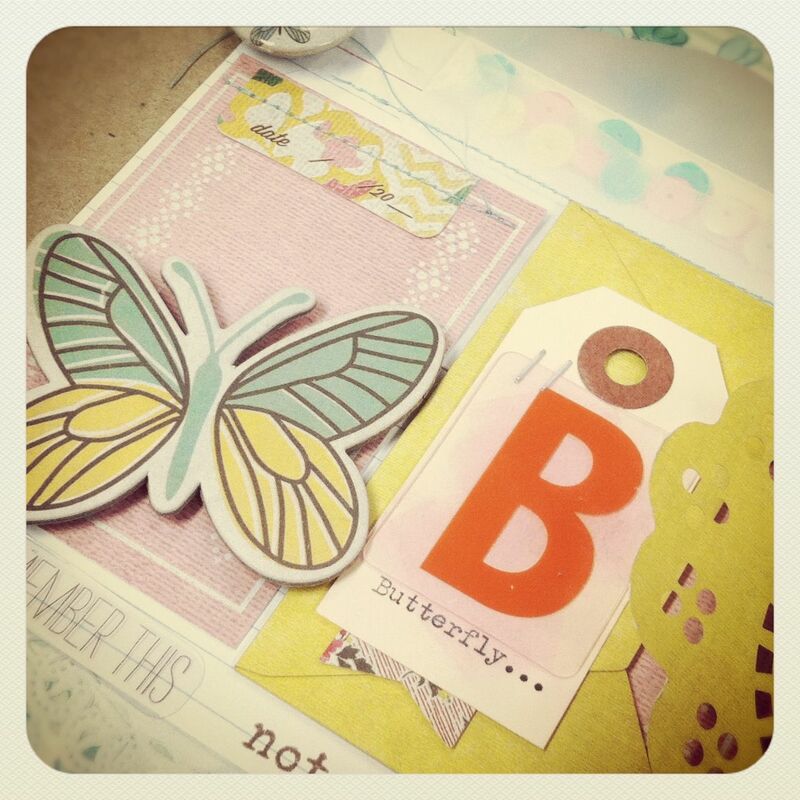 On the right I had an extra slot so I embellished a 3 x 4 card with a stitched on butterfly sticker then added some enamel dots. Love that. It worked out perfectly that the 5 & 7 on this insert was prominent. I circled those letters then added some more of the graphite pencil + water to highlight the 57 degree temperature. My right page was mostly about Easter decor and the dinner we had with my folks. 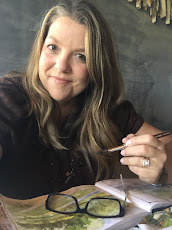 I'm always looking for fun spots to add journaling and here I typed right onto the photo in the blank spot of a dinner plate. Just run your photo through your typewriter. 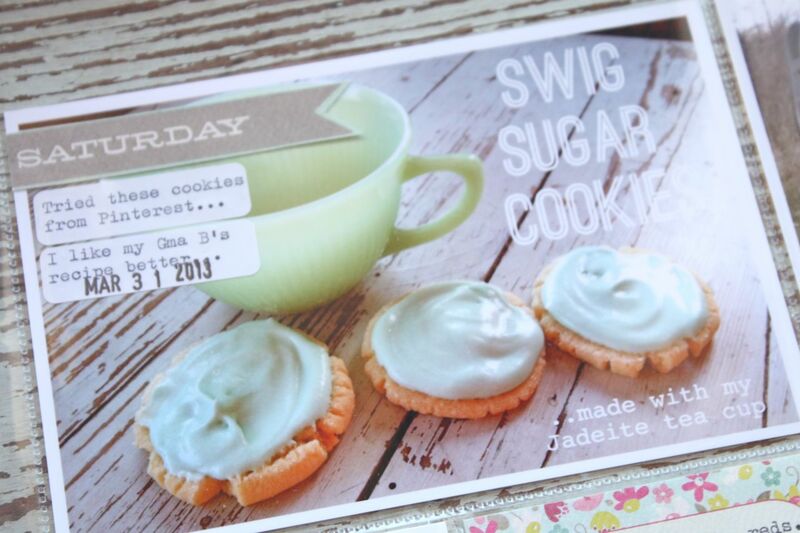 Here I used the Phonto app to add text to my photo of Swig Sugar Cookies. This recipe was popular on Pinterest this particular week so I tried them out for Easter dessert. Another fun week in the books. Well, it looks like I'm being talked into heading into town. The girls want to show me the pool they want + they think they're starving with no groceries in the house. 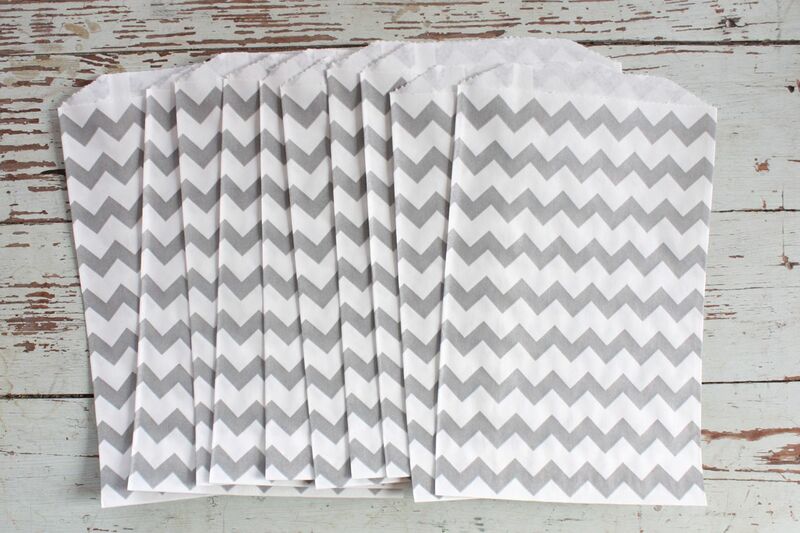 Be sure to check out yesterday's post as I've added some new items to the shop. Have a great weekend everyone!! Hey there, today I have added some new items to the shop. Yellow and gray are a new favorite color combo so I did a little shopping for some new packaging supplies. I put together a few of these kits and thought I would share. There's a fun little mix of sequins, clothespins and tags. I dug out some vintage playing cards I had in my stash and thought these could be made into cute tags. 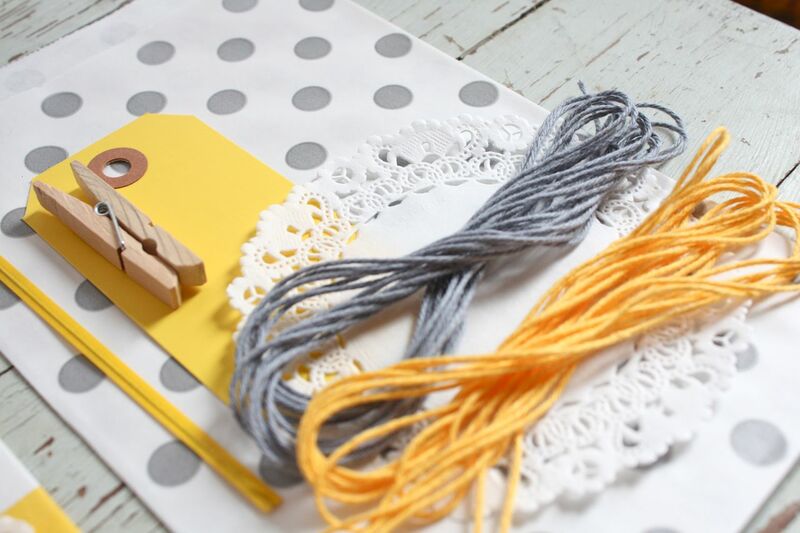 I love the new yellow and gray baker's twine. Remember, it's fun to leave the ribbon tails really long. 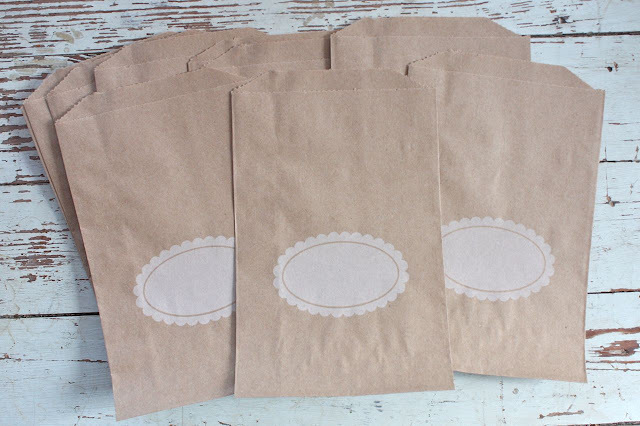 These new scallop design brown paper sacks are adorable, don't you think? I need to pull out my punches and dies to see if they work with this shape. I also added some of the single colors of the sacks....gray chevron. 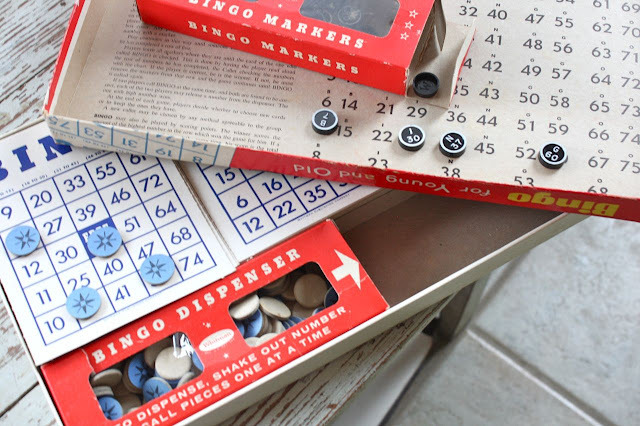 I've also added a few vintage items including this Bingo game. Jordy and I went through all the numbers and it's a complete set. Looks like it's never been used except for the box is showing some age. 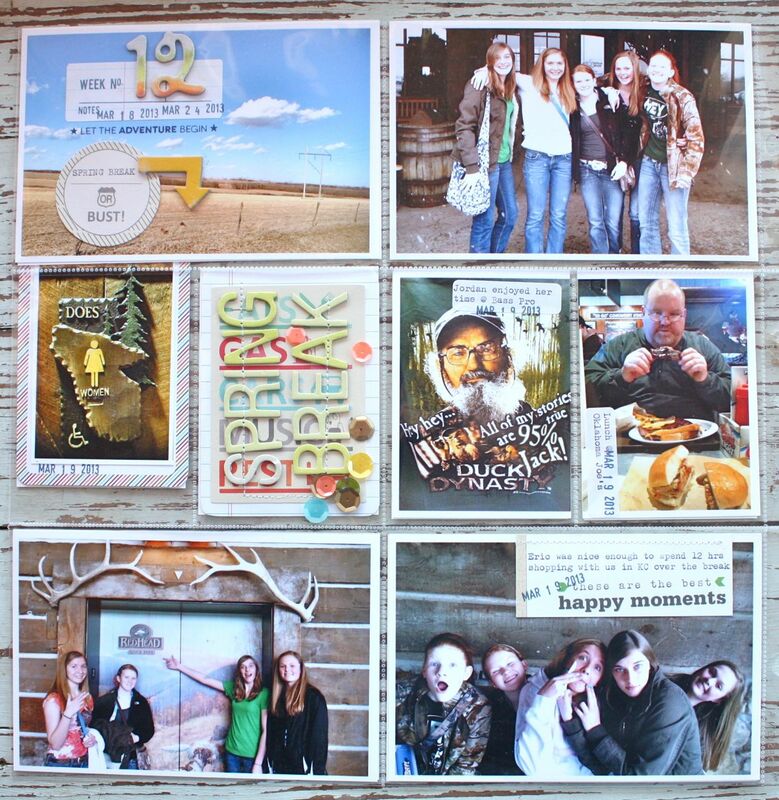 It makes me want to buy a cabin just so I can play this Bingo game in it! Vintage globe, boo-yah! Everyone needs a collection. 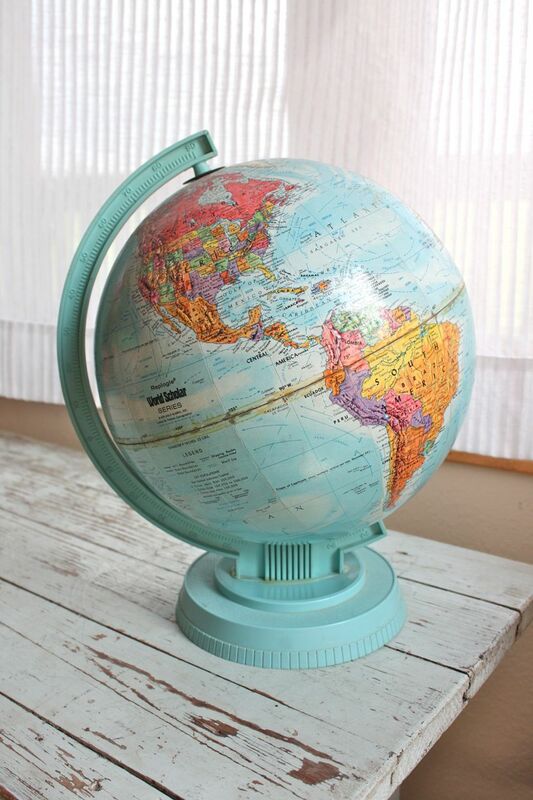 Ohhh, and I just heard from Josey that my sister-in-law brought home a big assortment of globes from the high school she works at. They're remodeling and I bet she did some dumpster diving. I really want to get a gander at those. 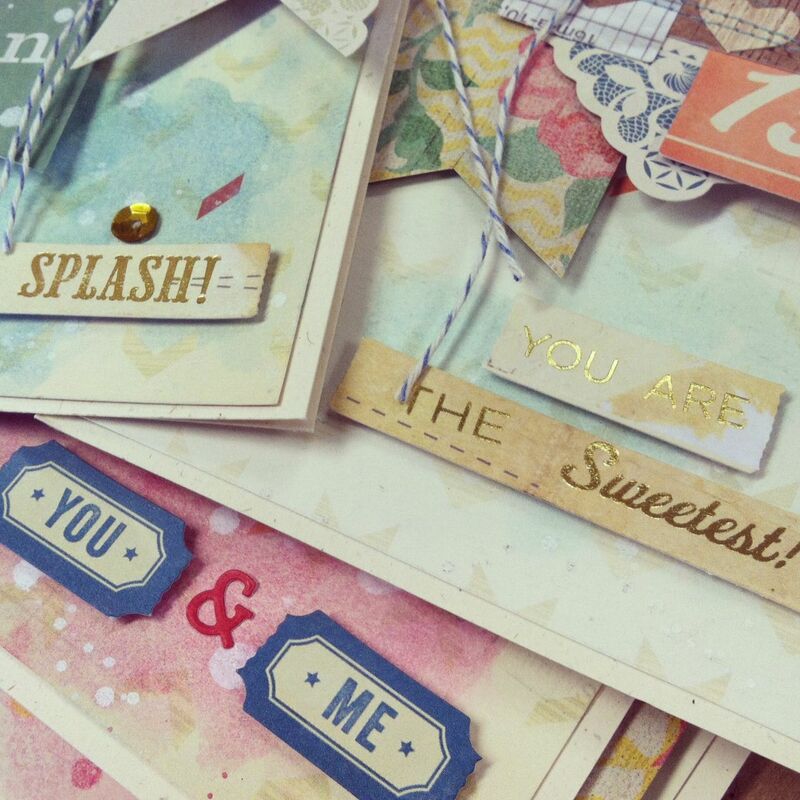 Sneak peeks for June Gossamer Blue..
Hey there. 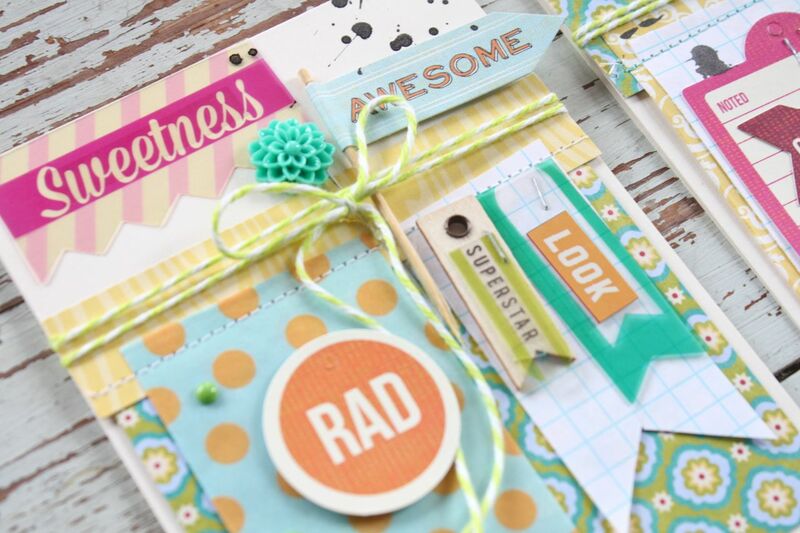 June 1st will be here soon and that means a brand new line up of Gossamer Blue kits will be available. As a reminder, kits and the Design Team Gallery debut on the 1st at 10am PST. Subscribers can shop for add-ons 24 hours earlier than non-subscribers with add-ons shipping for free. Kits ship on the 5th of each month and you can cancel your sub at any time with no fees. 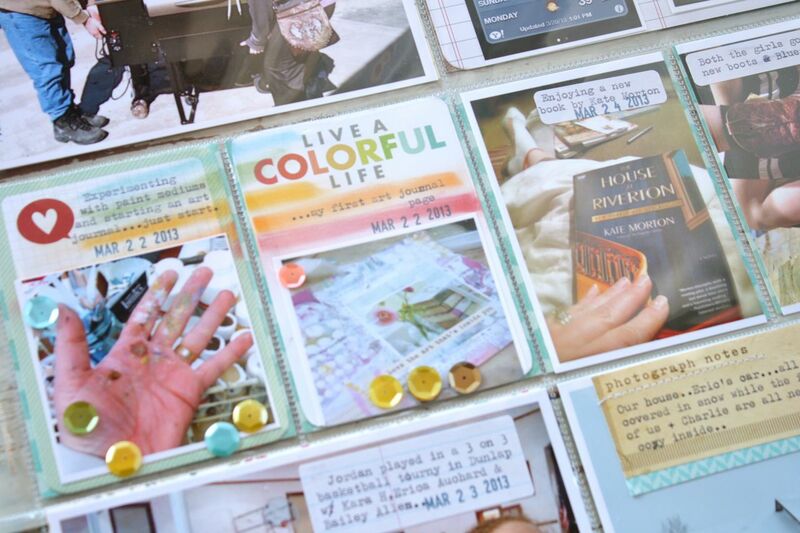 I've been posting my Gossamer Blue June sneak photos on my Twitter account and I wanted to share those with you today in case you don't follow my/or have Twitter. 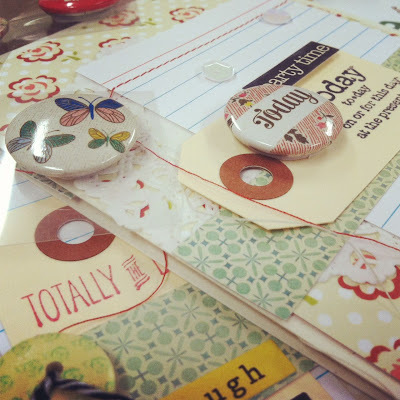 Here you can see a peek at 2 exclusive GB stamps + some flair badges that I absolutely loved this month. .....and here. 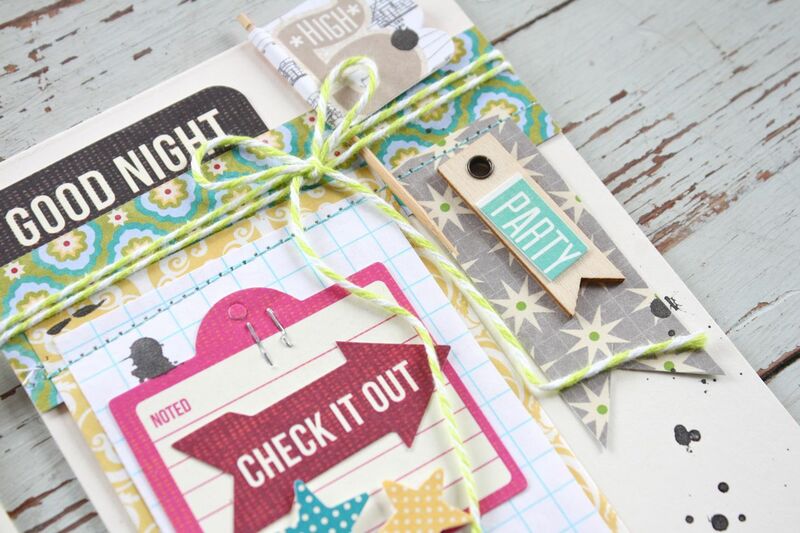 The gold foil sentiment labels add the perfect sparkly touch. I also tried out a little watercoloring on some cards. 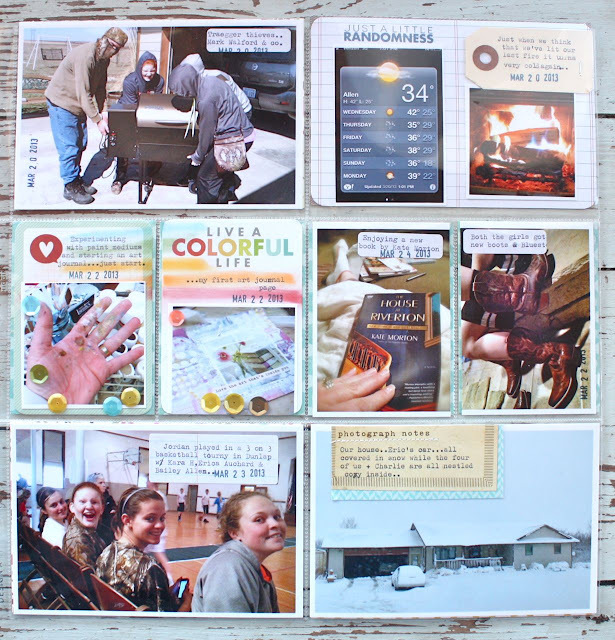 I've been known to sit and create a stack of my own customized Project Life journaling cards. 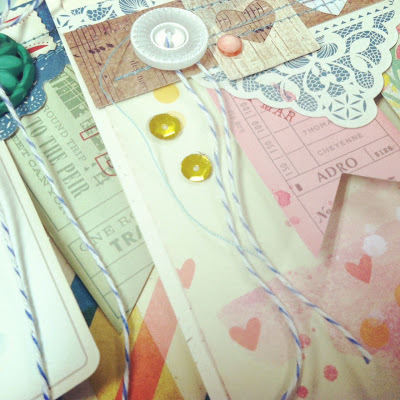 I think you'll enjoy an upcoming post about how I selected 4-5 other manufacturer's journaling cards and fancied them up with Gossamer Blue kit items. Notebooks are still a favorite of mine. 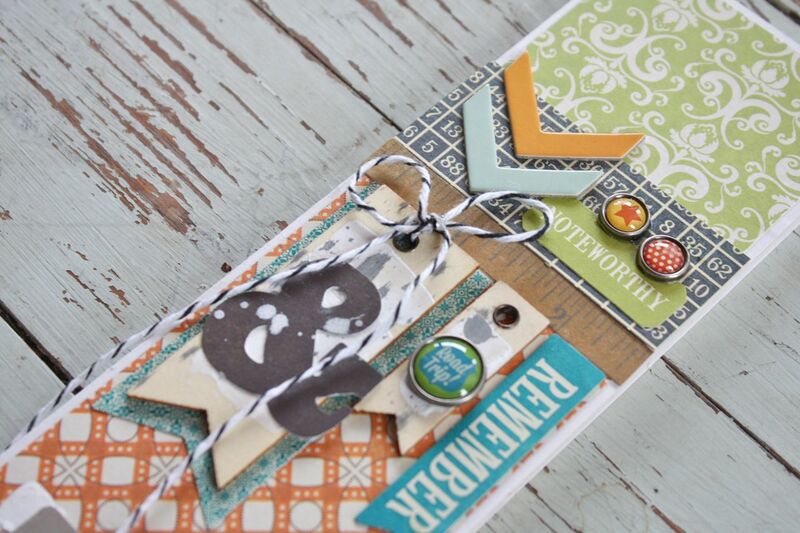 Here I used some of my favorite kit items + I tried out some Pan Pastels on the tag. More of the exclusive GB stamp here. The embellishments are just way too fun this month. 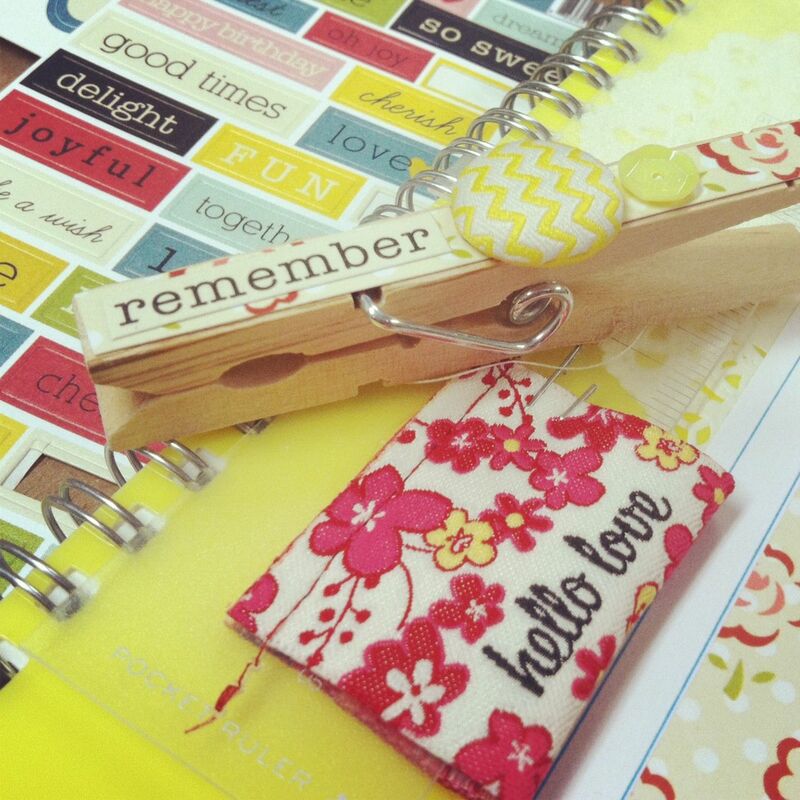 My clothespins never looked better. 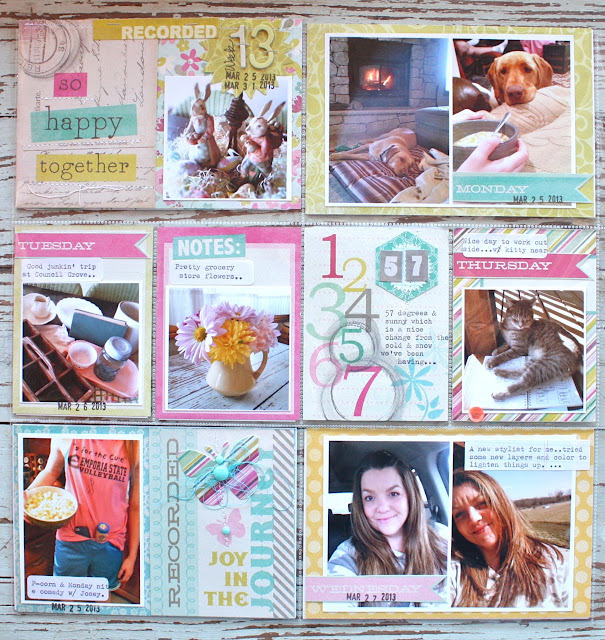 How about a whole Project Life spread using just Gossamer Blue products? I love the mixy matchy look you get from sifting through the kit items. By using just the kits, it's so easy to narrow down your products to use on a layout. Hello? 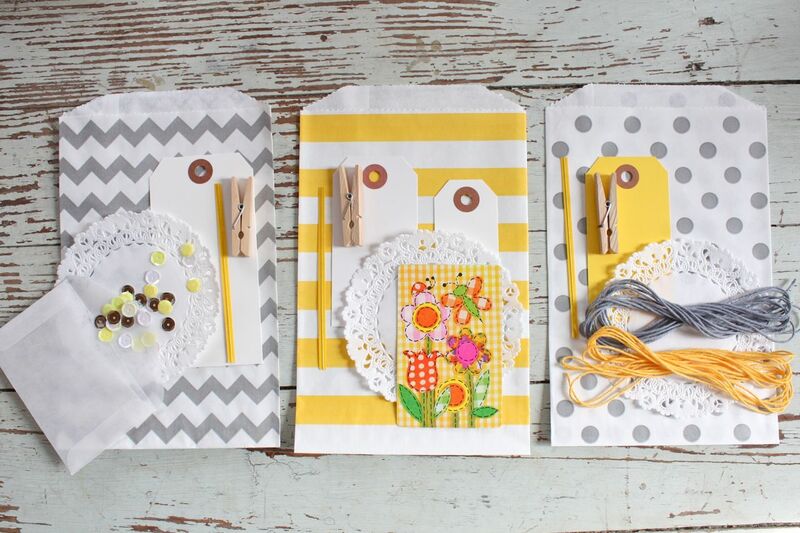 Doesn't this happy,yellow photo make you want to get crafty? I hope you'll join us this month at Gossamer Blue. The very talented and artsy May Flaum will be our guest designer for June & I can't wait to see her creations. We'll also be teaming up with some of the designers from Lily Bee for even more creative inspiration. Check back soon all through June for full blog posts of my projects. 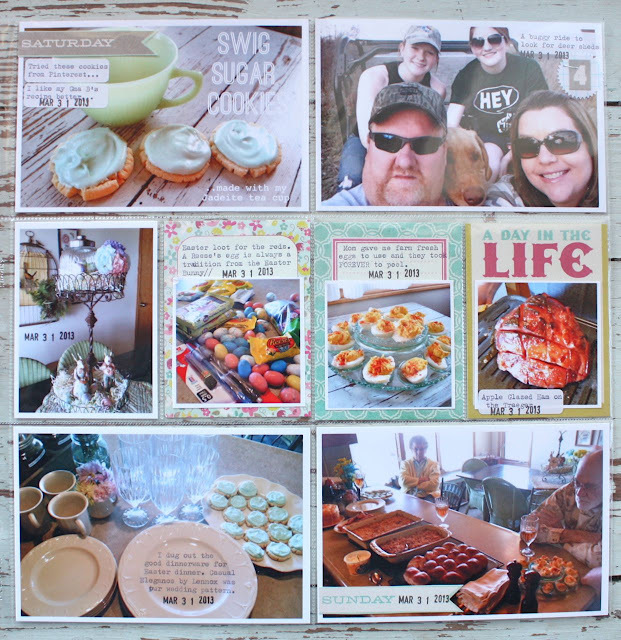 I'm slowly catching up on my Project Life now that all of the sporting and school events are done for the school year. 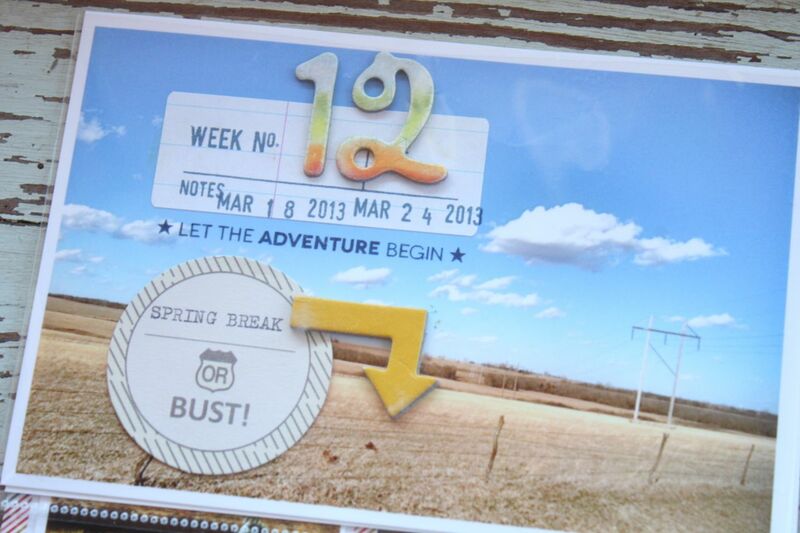 This is Week 12 which was Spring Break for the girls. They had basketball practice every day so they didn't get too much sleeping in time. The weather was still very cold and snowy so it was hard to get out and enjoy the weather. Since I had so many photos and many of them were on the darker side, I chose to keep this week pretty simple. I didn't do a ton of embellishing and the photos filled most of the slots. I chose to just make this a quick week of working on a spread since I was falling a bit behind at this point. I love scenery shots for the main, dated insert because you can use that wide open space for noting the week number, the dates + you can add in a few embellishments like I did below, noting it was Spring Break week. 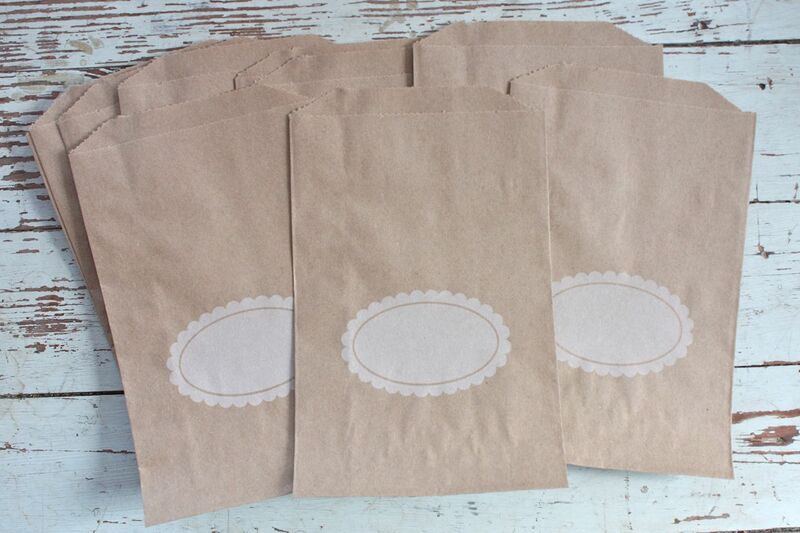 The Notebook Paper Labels from my shop worked nicely for some simple stamping. 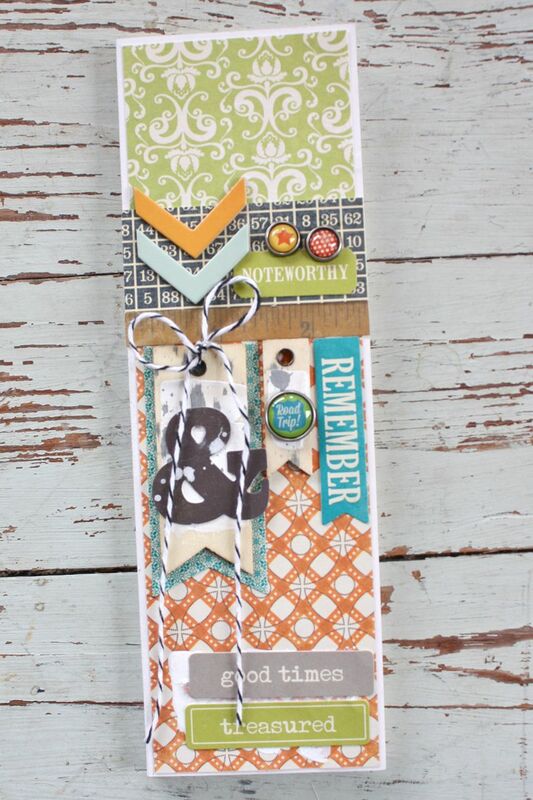 The little round tag is from Chic Tags. Here I used some of my favorite chipboard letter stickers and sequins over another Chic Tag ATC card. Hey everyone. We're off to an early weekend as we head out to the State track meet. Josey qualified in the open 400 meter. Wish her luck to make it to the finals. She runs tomorrow for preliminaries to qualify. 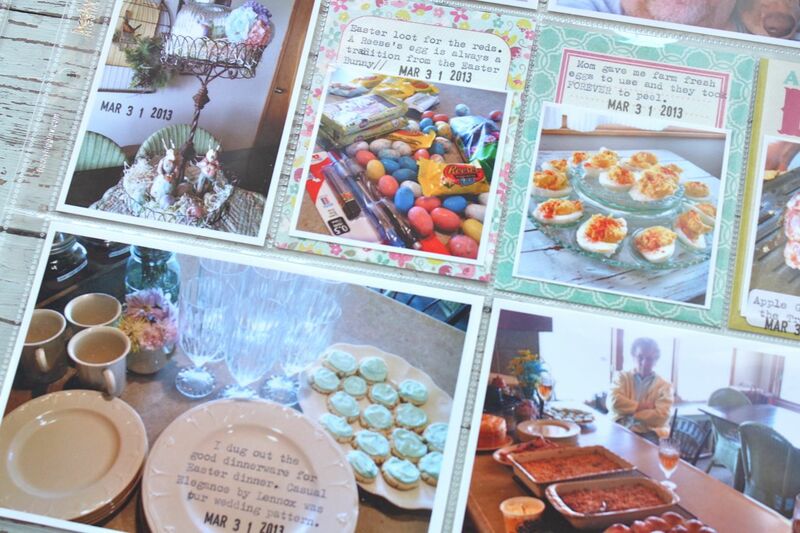 Before we head out I thought I would share the last of my Gossamer Blue projects for May. Once I'm done with my assignments for the month, I like to gather up all the unused kit items and see what I can create with the leftovers. I came up with 3 cards and a fun notebook. You've already seen the card on the right in a previous post using Pan Pastels. 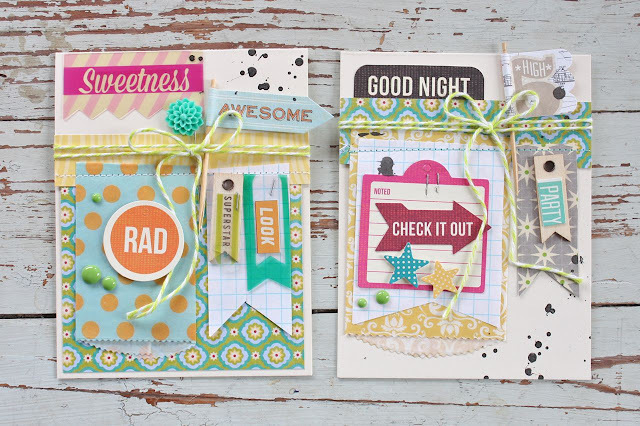 These two cards are just wild and crazy and topped with oodles of products. I like to reserve these types of cards for the girls to pick through for birthday cards. The teens just love the crazy mix and colorful collages. 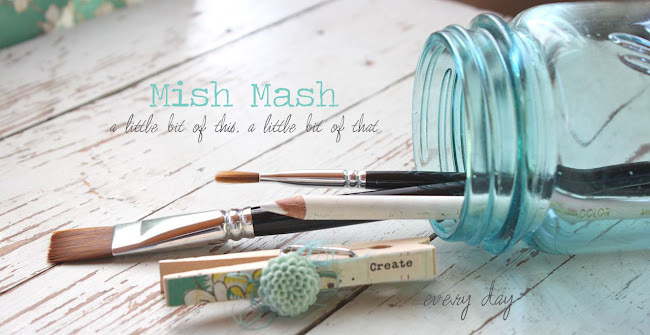 This is where you can do some unconventional combinations and just play with the products. 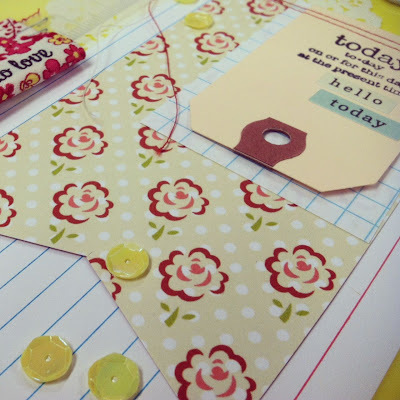 Here I used a leftover polka dot sack, a resin flower, a toothpick flag and more. It's all fair game. 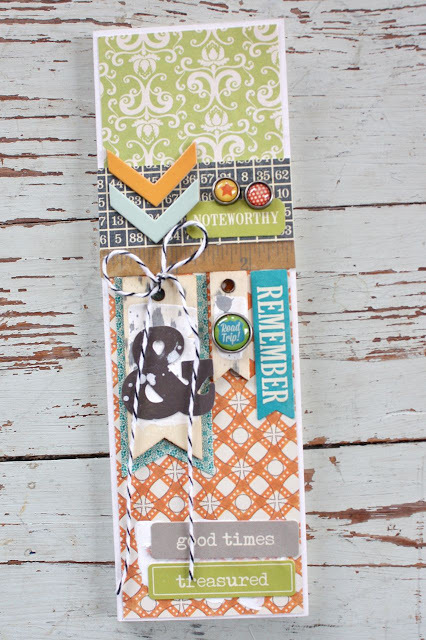 Here's more of the same with layered labels, wood flags and partial words cut from die cuts. They're a but bulkier so I always keep these with a stash of sacks from my shop and tuck in a candy bar, pack of gum etc for a gift. 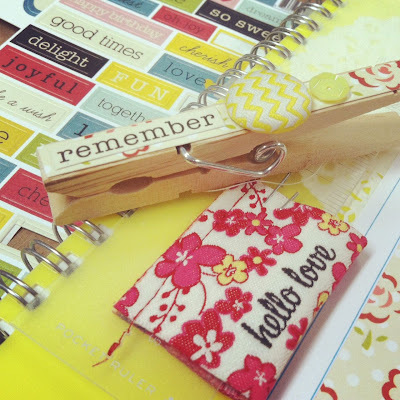 Here's a fun notebook that I plan to take with me on our Summer road trips. I always need a little notebook to jot down some cool ideas I saw at a junk shop or maybe a note for Project Life. I loved adding some white Gesso to the wood pieces then adding embellishments on top. Just a crazy mix of colors that are kind of vintage and fun! 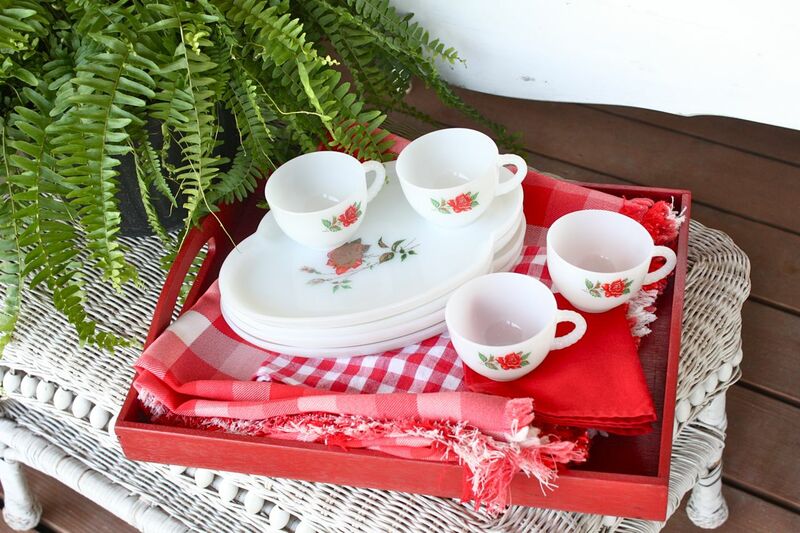 As a final note, I've got this fun, red picnic ensemble in the shop. 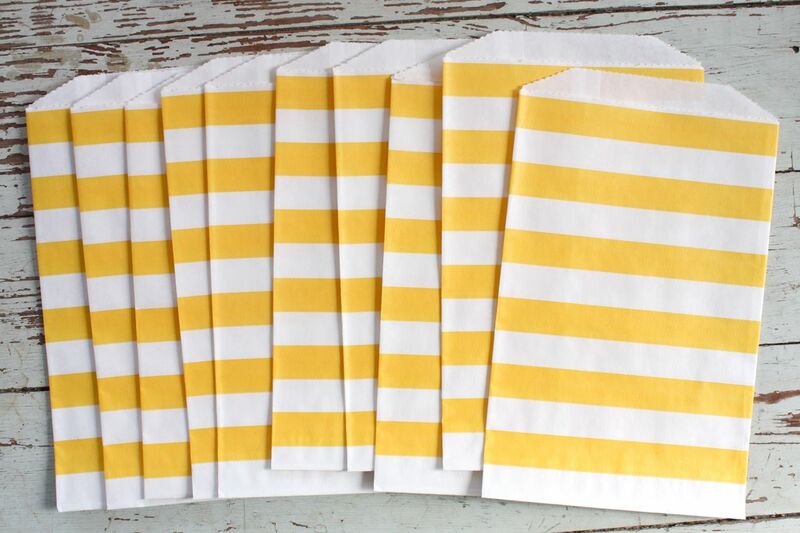 It comes with the pretty set of 8 trays and cups + lots of linens to dress up a summer tablescape. 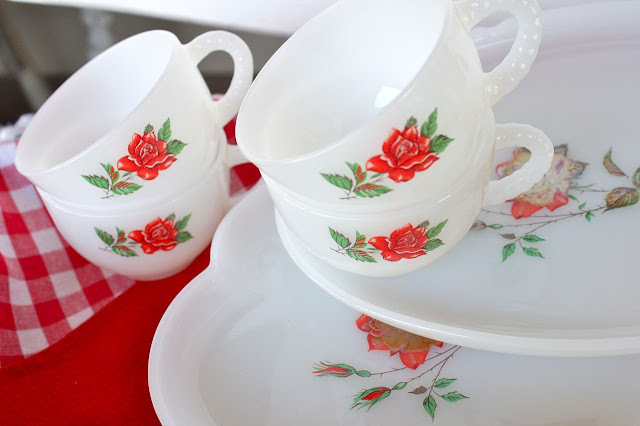 Cute little dishes with a rose pattern. 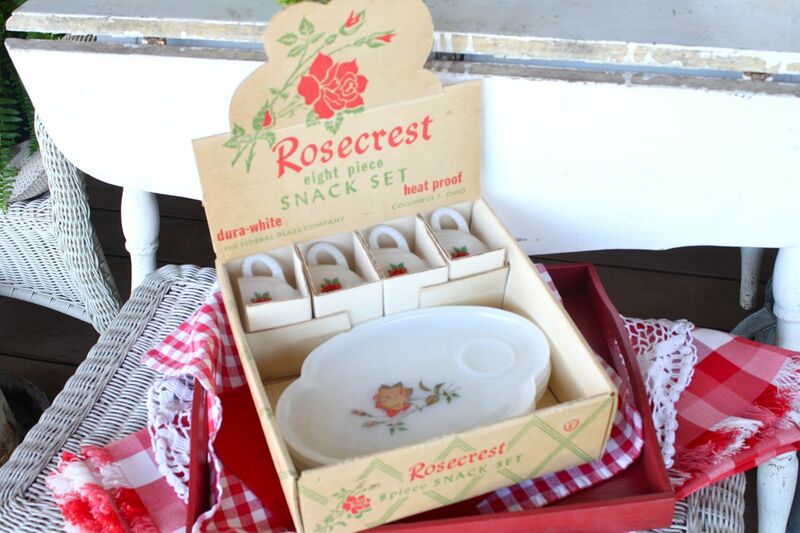 I love the original packaging that the snack set is in. It's pretty rare to find the original box. I think this is cute enough to display the dishes just like this. Hello everyone! Thank you for the birthday wishes. We ended up the evening last night by celebrating with an ice cream cake and watching 2 funnel clouds. Exciting stuff! We're all okay. Today we start the first week of SUMMER break! 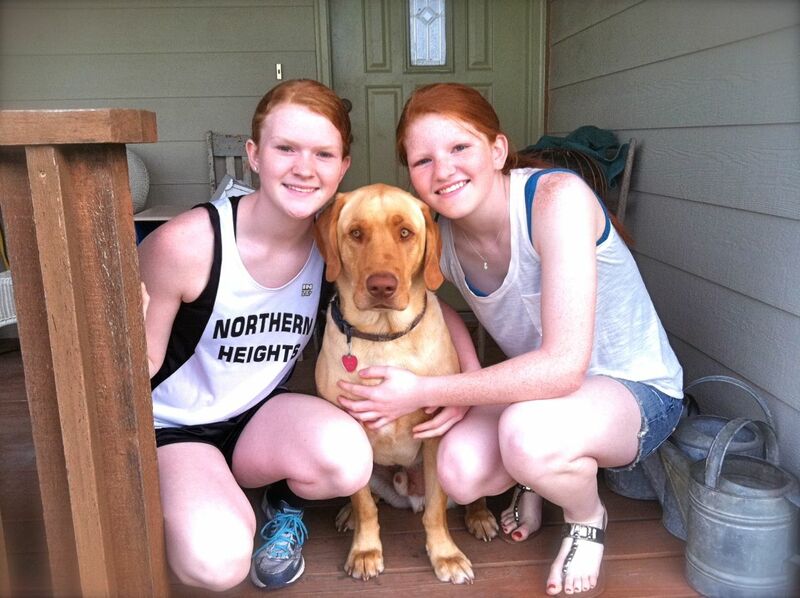 Woohoo, I love having my girls at home with me more. Today I'm sharing more cards made from the Gossamer Blue May Kits. 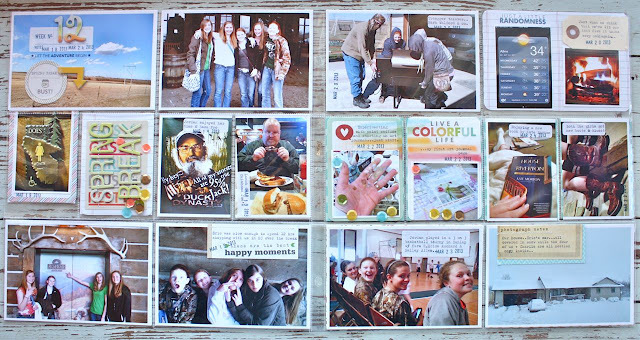 If you're like me, you love seeing all the inspiration you can get from a kit once you have it in your little hands. I post my projects for a particular month all throughout the month so you can continue to be inspired. 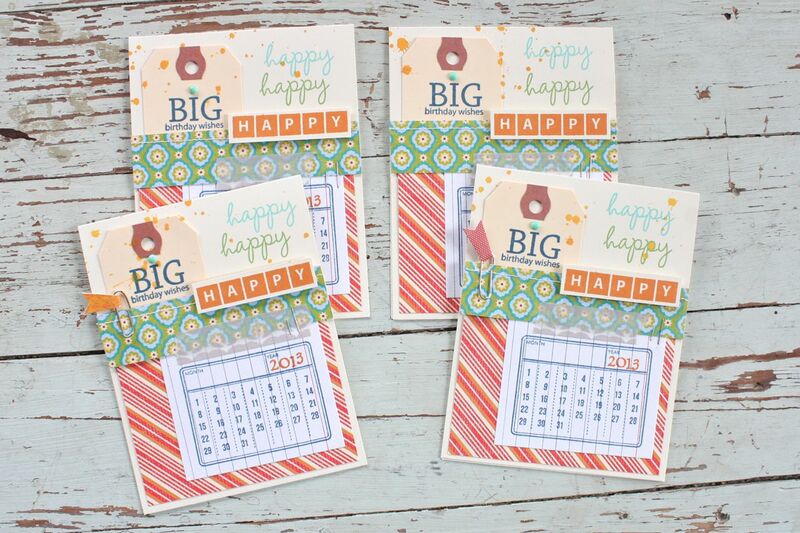 Here we go with some fun birthday calendar cards. The fun calendar is from the May Bits & Pieces Kit and the patterned papers are from the May Main Add-on Kit. You can see all of the kits here. For the tops of my cards I used various Papertrey stamps from my stash. 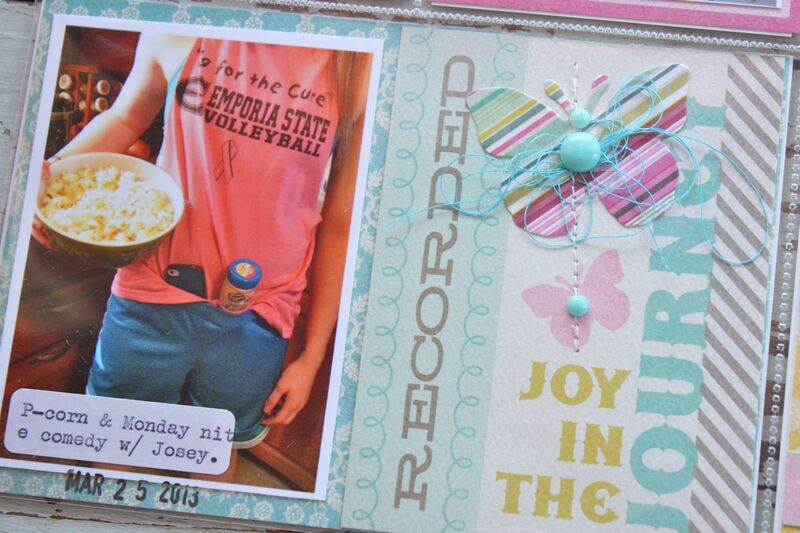 I stamped them in fun colors that coordinate with my papers. 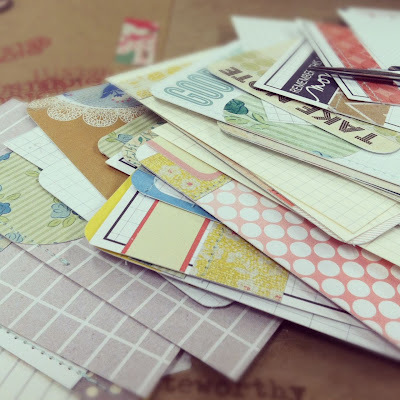 Some of the sentiments were stamped directly onto the card fronts, some were stamped on Medium Manila Parcel Tags and some were stamped onto cardstock that I cut out with my scissors. I splattered some orange ink onto the tops of the cards. 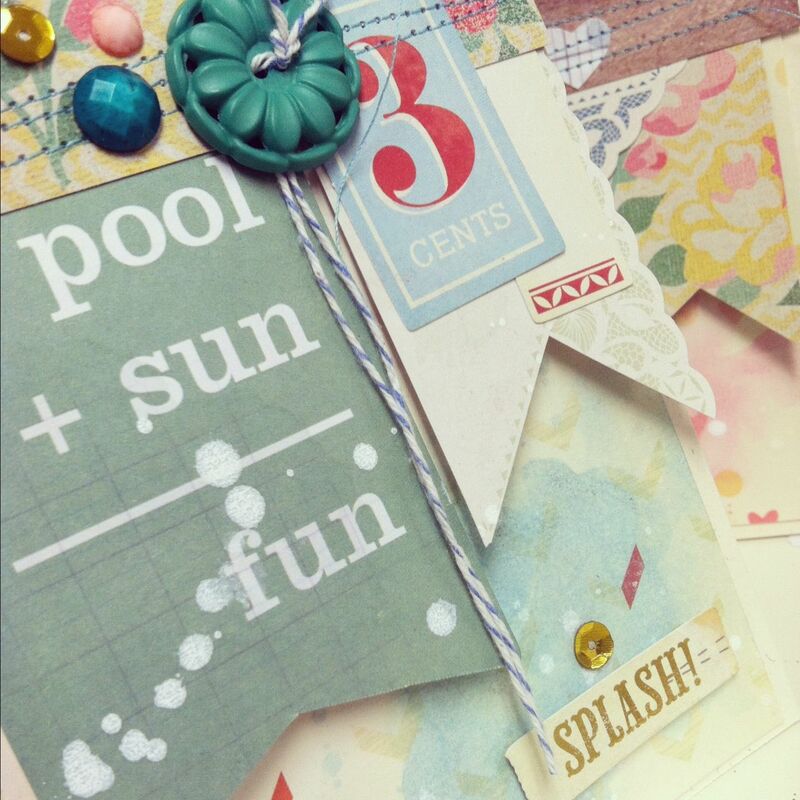 The fun paperclip flags are from the May Bits & Pieces Kit. For the bottom of my cards I stamped the calendar stamp from the May Bits & Pieces Kit onto a simple index card. Using small number stamps I stamped the year "2013". 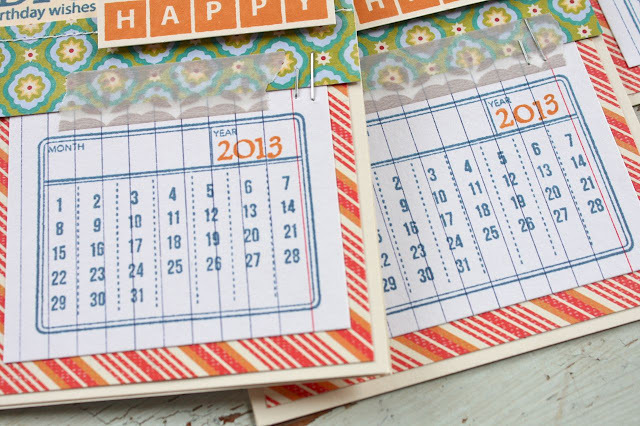 When I'm ready to send our a card I'll stamp in the month and then use a small circle stamp to highlight the date of the birthday. I love the fresh colors on these cards. I also have a sneak peek at what's to come for Gossamer Blue in June. Below I used one fun embellishment pack to create some easy card toppers. After the June release I'll be showing you how to create 8 quick cards from just the one pack of goodies that will be in the Main Kit + a few other supplies from your own stash. 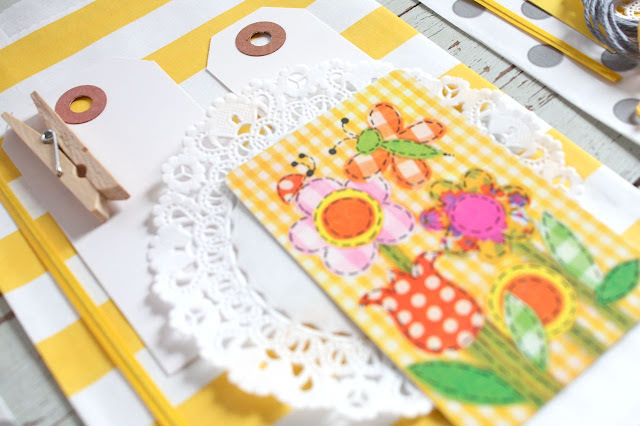 Perfect for Summer themed cards. 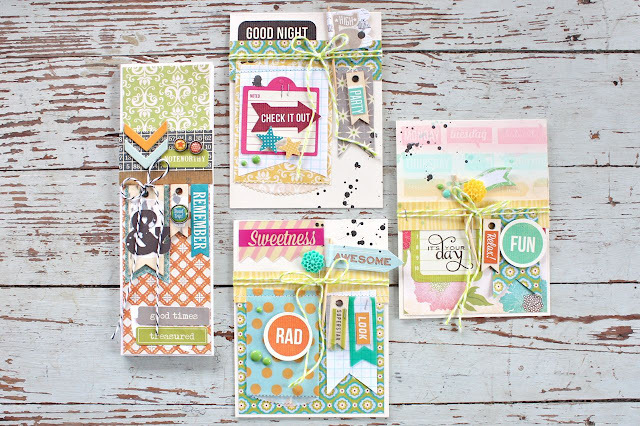 You can check out more of the June Gossamer Blue Kits sneaks by clicking on the Look Book link. The colors coming are just fruit-punchy and fun! 1. Kits are available on the 1st of every month. 2. Subscribers can shop for add-ons 24 hours earlier than non-subscribers, with a $5 discount off the main kit. 3. Main kit is $34.95 or $29.95 with a subscription. 4. Subscriptions can be cancelled at any time with no fees....a very easy commitment. 5. Kits ship on the the 5th of every month. 6. Kits include a mix of manufacturers items including patterned paper, cardstock, digital elements, embellishments, stamps and Gossamer Blue exclusives. I'm always impressed by the current selections that Lori picks for the kits. 7. The Look Book (sneak peeks) debuts on the 15th of the month. 8. 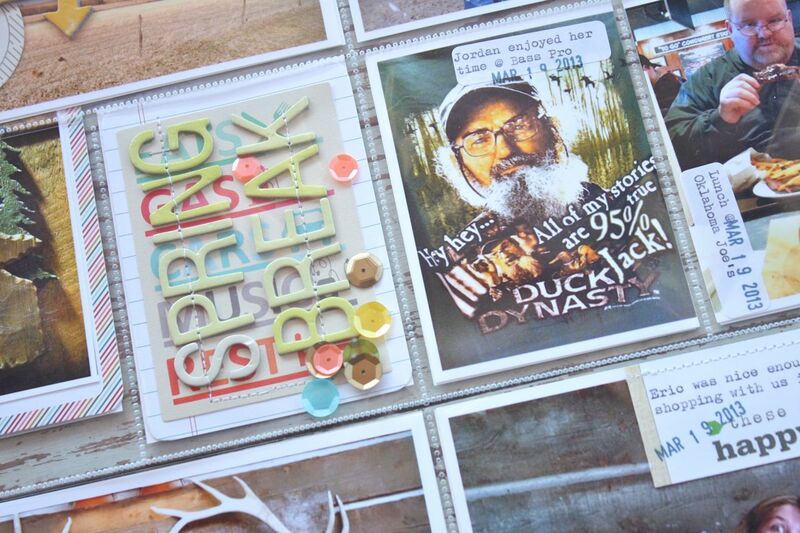 We have a blog + a Design Team Gallery and a Member Gallery for great inspiration. Thanks for stopping by today. 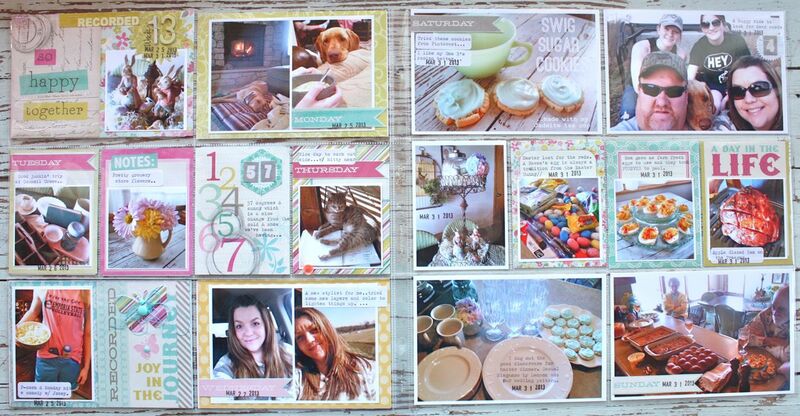 I'm off to finish up the cards from my sneak peek photo. 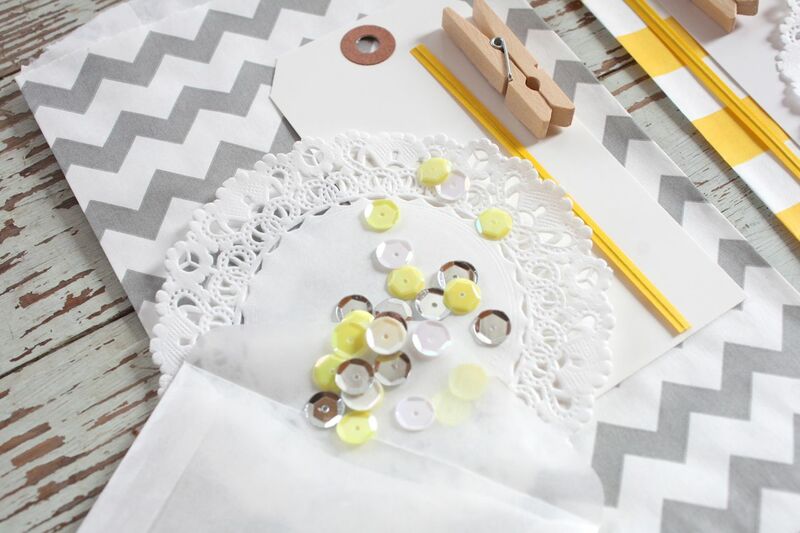 Hope you have a crafty day. Here we are, the last day of school! I can remember that awesome feeling when that final bell rings and you are out the door for Summer. Can't wait to have my reds here the entire Summer. 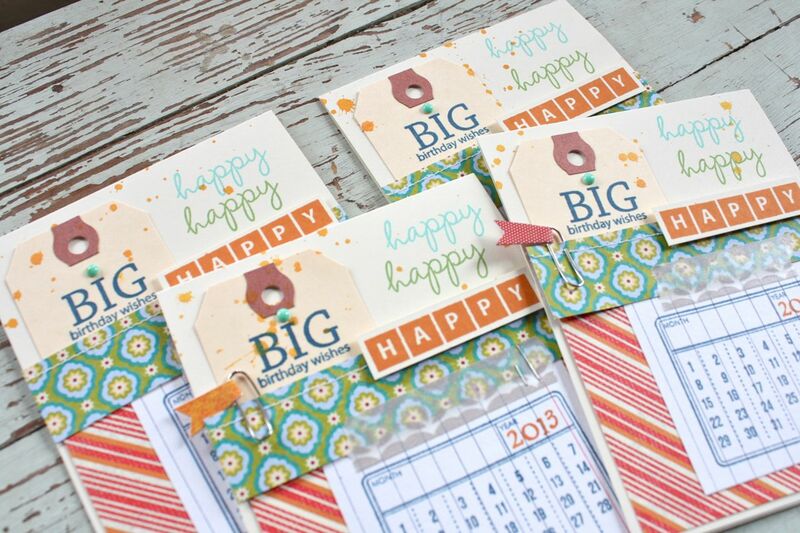 It's going to be busy as I have a big Bucket List of projects to tackle, trips to take and things to do. I'm so thankful to have such a great family to share it with. 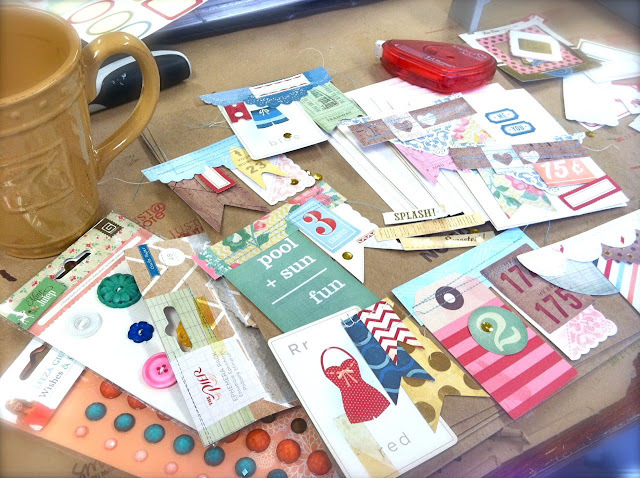 I took a road trip last week for a one day class in Oklahoma City with a crafty friend. It was awesome. Dina is awesome. 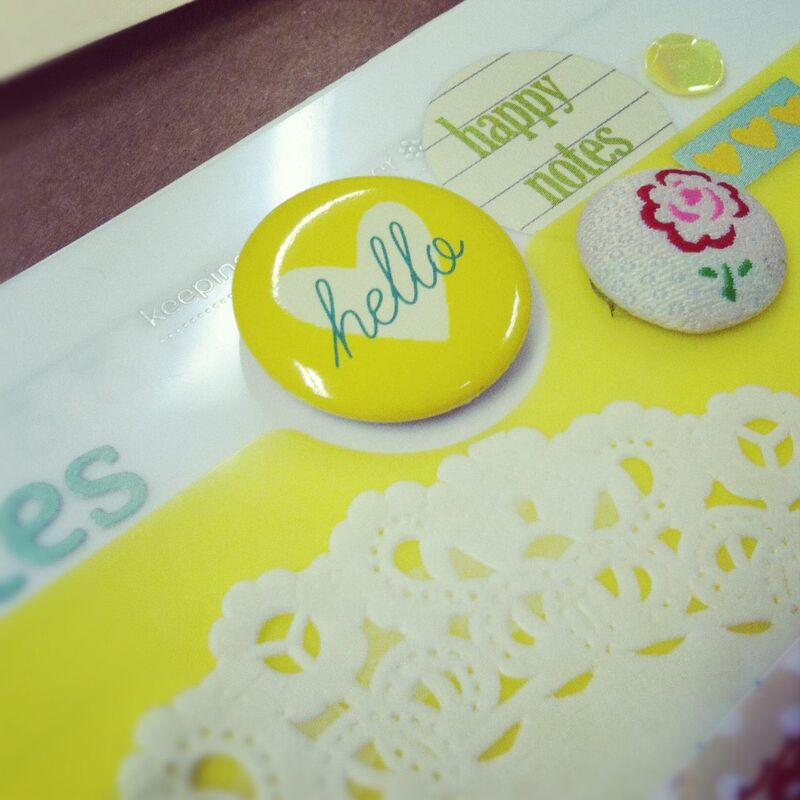 I'll share more in a full post, including the mini book I made and my thoughts on incorporating those techniques into my cards and scrapbooking. 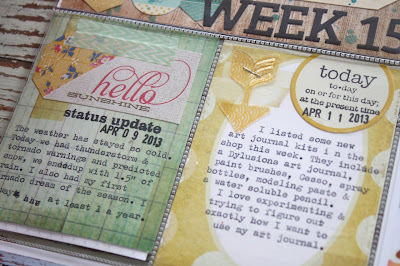 Below are some pages in Dina's fantastic vintage ledger journal. I'll be working soon on a post of my thoughts on how I've been creating lately. I have some thoughts on keeping some staple items, using kit items and incorporating in vintage, found items. I think you'll like this post. I finally carved a wee bit of time to work on a Project Life layout. 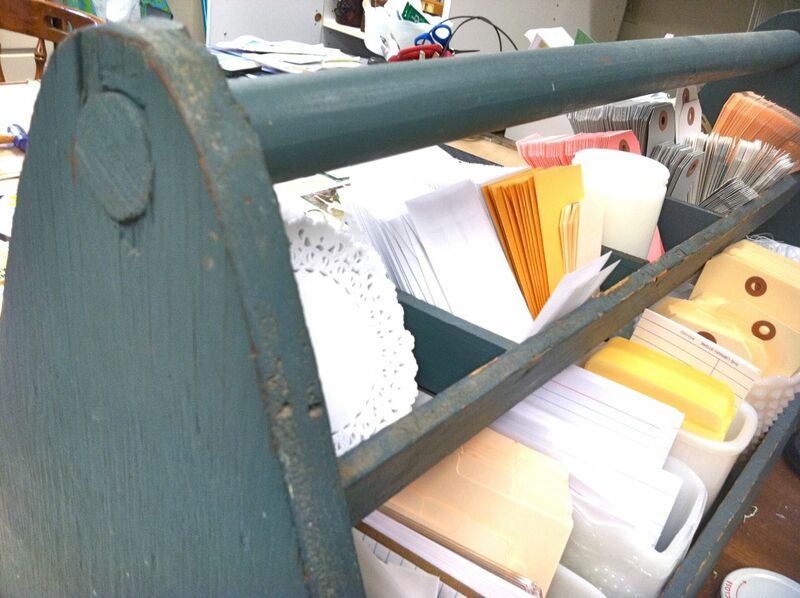 I was very happy with this little insert that uses my new glassine envelopes and sequins. 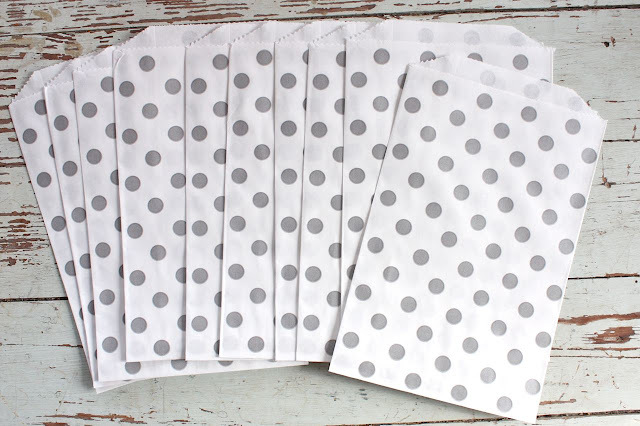 I've got lots of goodies in the shop that can be used on Project Life pages. 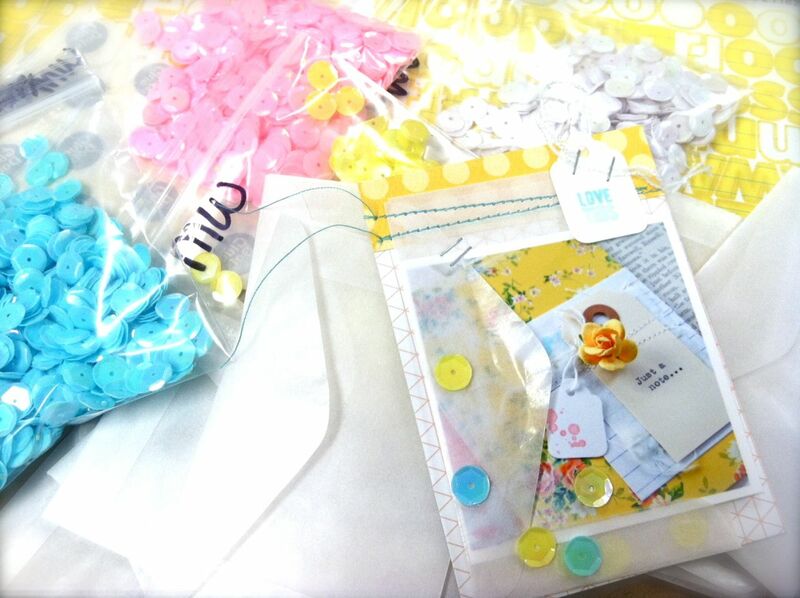 I'll be re-stocking the colored sequins soon & the neutral packs are still in stock. I made this recipe for lunch yesterday. All veggies & so good for you. I loved it and I'm sure it will become a staple this summer. You all know I love a good, refreshing Summer drink. I'll be sharing my new favorite soon, once I get it perfected. I'm outta here, folks. We're picking up Jordy and a friend after school and we're headed to the Regionals track meet. We need your prayers for Josey to make the top 4 so she can go to State in the 400 meter open. I know she can do it!! Later this weekend I'll be working in the flower beds. Sunday is my birthday so I'm sure we'll head to the nurseries for a boat load of flowers, my favorite gift. We might try some homemade pizzas on the smoker too. Have a great weekend, everyone!